1. Heat the lentils in the water from the can into a small saucepan. 2. Prepare the pasta as directed on the package. 3. 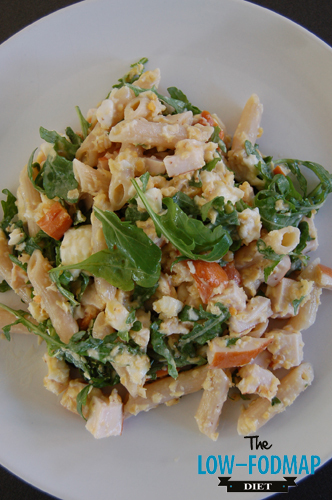 Cut the chicken and mozzarella into small pieces and add it to a salad bowl. Add the rocket salad. 4. Drain the lentils and the pasta. Rinse the pasta under cold water for a second. Add the pasta and the lentils to the salad bowl. 5. Make the dressing with the mayonnaise and olive oil and mix it into the salad. Season with salt and pepper.